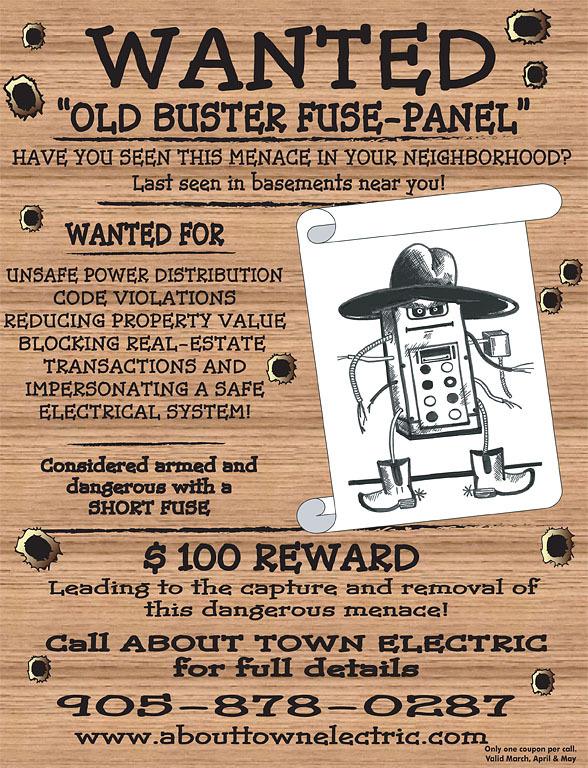 REPLACE OLD OR DAMAGED OUTLETS & RECEPTACLES! Older homes may have receptacles which are damaged or which, otherwise, may have deteriorated over the years. Older outlets can deteriorate from repeated use, from plugging-in and unplugging appliances as is often done in kitchens and bathrooms. As a result, when plugs fit loosely into receptacles, especially the two-prong ungrounded type, they may slip partially or completely out of the receptacle with only slight movement of the attached cord. Receptacles in this condition may overheat and pose a serious fire hazard; if covered by a curtain or drape, the fire hazard is even greater. Another method of protection in the home is to install 3-wire receptacles which will accept either 2 or 3 prong plugs. Have a qualified electrician replace deteriorated and damaged receptacles and at the same time take a look at other safety upgrades in your homes electrical system. DON’T ABUSE YOUR FUSE PANEL!